Yangon Cycling and Trekking To Golden Rock . The Kyaikhtiyo Pagoda, also called the Golden Rock is one of Burma’s most sacred Buddhist sites. 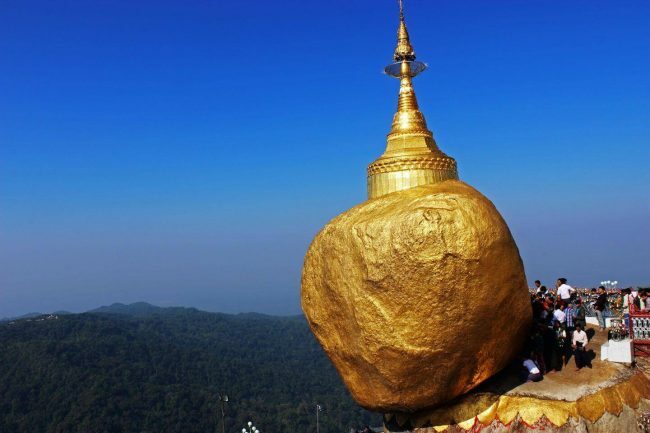 A massive boulder on the edge of a cliff with a pagoda on top of it enshrining a hair of the Buddha is an important pilgrimage site for Burmese Buddhists. The huge Golden Rock in the mountains North East of Yangon hanging over a steep cliff provides for an amazing sight. The rock that appears to be gold is actually a granite boulder that is covered with gold leaf applied to the rock by Buddhist devotees. 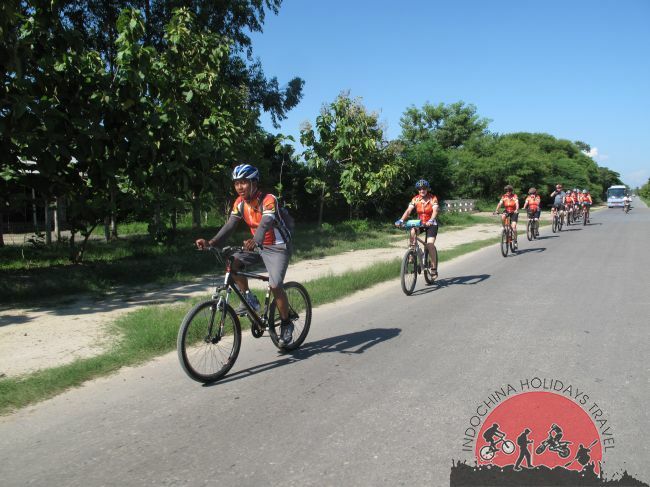 8:00 Am our Myanmar cycling tours team will pick you up at your hotel, our truck loaded with the mountain bikes will pick you up to start the taste of a little bit of adventure. It takes about 4 hours to reach the Kinpun Base Camp where you start your hiking up to the Golden Rock. On the way, the Ancient Capital of Second Myanmar Dynasty, Hantharwaddy, or Bago presently named. You can do the sight-seeing at Bago on the way back. Upon arrival, leave your bikes and equipment at the hotel, Golden Sunrise. Start your hiking up to the summit of Golden Rock, approximately 7 hours up to the summit of Golden Rock, Paung Laung mountain measuring 1000 meters above sea-level. The distance from Kinpun Base camp to Golden Rock is just 8 miles. Thousands of pilgrims will be your fellows who are also doing trekking and hiking to the Golden Rock in order to get more merits than those going up by open truck. The views and sceneries on the way up to the top make your tiredness relieved. You may take a rest from time to time at the rest houses all the way up. Upon arrival, check-in at your hotel and you can visit Golden Rock from your hotel in the evening or at night. Early morning, after breakfast (you may go to Golden Rock again in the early morning if you want!! ), walk down to Hermit Hill to take the open truck ascending to Kinpun Base Camp where your mountain bikes are waiting for you to taste your cycling adventure. Upon arrival at Kinpun base camp, get yourself equipped with the necessities; Helmet, Gloves, Sun Glasses and so on. Start your biking from the base camp to Kyaik Hto town approximately 25 minutes along the High way. From the town, Kyaik Hto, turn to the rice fields to start the Unspoiled Biking Route to Kyaik Htee Saung Village. The scenes all the way to the Village relax you bit and piece and you never feel tired. Passing by the Mon Villages, you will arrive at the foot of Kaylartha Hill (The history and excavations strongly prove that on the other side of the foot of that hill lies the Thuwuuna Bhumi Kingdom, the Kingdom of the Gold!). You start your hiking up the Kaylartha Hill for the awesome views to the Mataban Sea and Bay. 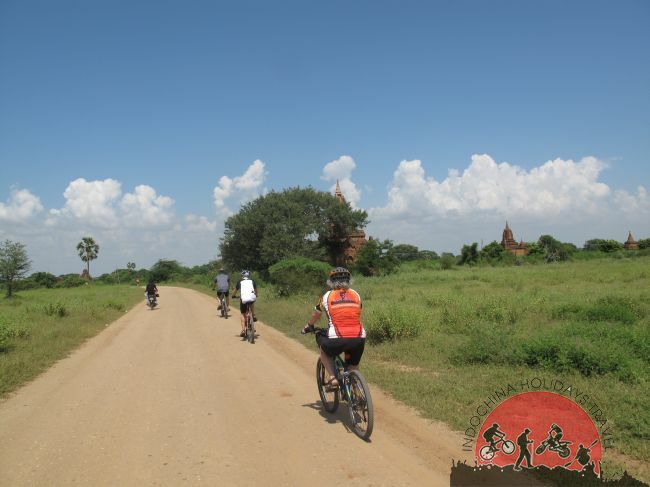 After a rest on the Famed Kaylartha Hill and the Pagoda which is believed to have a Buddha’s hair enshrined, you may walk down to your bikes on the Cycling Route to go ahead to Kyaik Htee Saung Village. Kyaik Htee Saung village is very famous for its monk who is believed to attain the last stage of Nirvana and many a pilgrim visits him daily. Besides that, it has the ancient Granite Kingdom Wall. You will arrive there around nightfall. Enjoy the photographing to your heart’s content all the way to the people, villages, and old palace wall. Then, drive back to your hotel in Kyaik Hto. After breakfast, drive to Kyaik Hto town to visit Kyaik Hto Morning market where you can see a lot of local foods, seasonal fruits and vegetables, fish and prawns. Walk around in the market and take pictures. Talk to the vendors who are very friendly and not accustomed to the visits of foreigners. Then, proceed to Bago. On the way, stop from time to time to take the photo opportunities at some villages. Upon arrival at Bago, visit Shwe Maw Daw pagoda, the biggest and tallest Pagoda in Southern Myanmar,Bago Central Market, Shwe Thar Lyaung(Reclining Buddha) which dates back to centuries and which has the astounding history of its recovery from the bushes, and finally before continuing to Yangon, on the way visit Kyaik Pun pagoda with four Giant Buddhas sitting in back-to-back position. Upon arrival at Yangon, transfer to your hotel for check-in.